The platform promotes public engagement while providing a suite of energy services. Clean energy solutions need not be limited to rooftops and control rooms, according to the founders of Totem Power, a Bedford, N.Y.-based startup that emerged yesterday from stealth mode. 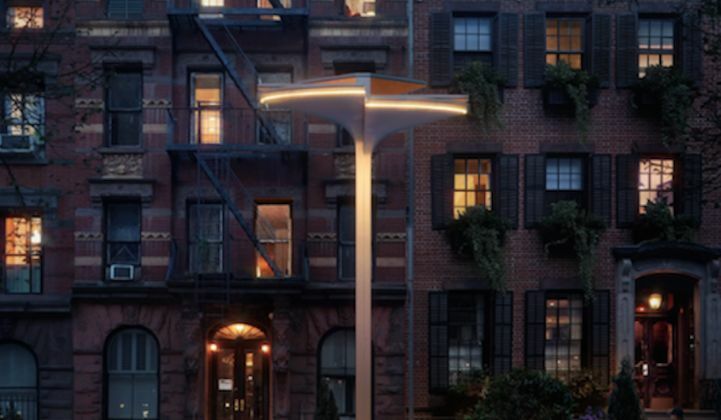 Instead, CEO Brian Lakamp envisions a future where city sidewalks are lined with 18-foot solar-powered towers that provide a suite of energy services where they’re needed most. 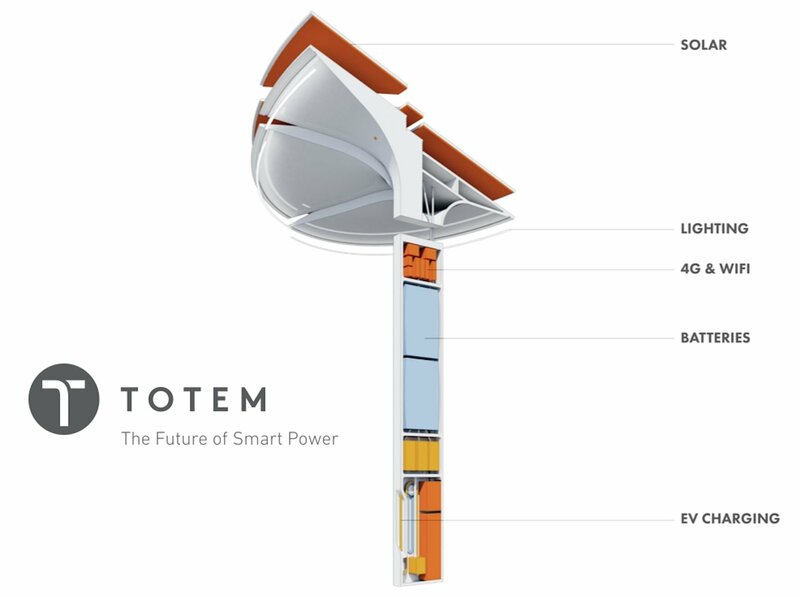 The Totem platform combines solar energy with battery storage, Wi-Fi and 4G communications, electric vehicle (EV) charging and smart lighting into a single product with multiple functions to serve smart cities. While most other players in the distributed energy marketplace sell these technologies separately, Totem believes there’s value in selling them to companies and communities as a system. The product is also designed to raise public awareness around clean energy. The EV charging station, lithium-ion batteries, communications equipment and lighting fixtures are all stacked inside of the Totem tower and topped off with a solar canopy in a form that resembles a palm tree. “We’re on a mission to realize the full potential of energy’s transformation by providing communities and corporations with intelligent, experiential and engaging structures -- something that delivers powerful functionality and tells an easily understood story about clean energy and the next generation of critical services,” said Lakamp. “The combination of communications infrastructure and energy infrastructure provides the foundation for smart city services, and provides a platform for long-term growth and evolution of a whole host of capabilities that will become really important for the cities of tomorrow,” he added, but wouldn’t elaborate on how this concept relates to Totem’s future offerings. Lakamp, the former president of technology and digital ventures at iHeartRadio, decided to get into the energy business after his wife proposed putting solar panels on their roof at home. Lakamp then got to thinking about why there aren’t more clean energy projects in public view. Tesla has done a good job of designing energy products for the home, but very little product design has been applied to commercial and public infrastructure, he said. Totem isn’t the first company to offer a public-facing solar product. Companies like Spotlight Solar have similar offerings. These arrays are predominantly used as marketing tools, strategically placed to boost interest in solar technology. By comparison, conventional rooftop projects are much bigger and have the advantage of leveraging existing infrastructure. Because the solar capacity on board each Totem tower is limited, Lakamp noted that the company would primarily look to work with customers that already have or are planning to install rooftop solar. However, the solar power on board the Totem platform is significant. Each tower is outfitted with a 5-kilowatt solar array, which is the average size of a residential PV system in the U.S.
Plus, the Totem tower isn’t just about solar. The 44-kilowatt-hour on-board battery -- designed primarily to offer peak management for the associated property -- is likely to provide as much or more value to customers. On-board storage means each Totem platform is also capable of standing alone, which means the towers could play an important role in meeting critical power and communication needs in the event of an outage. It’s still very early days for Totem. The company is just beginning to build its prototypes and test the market. It’s unclear how much appetite there will ultimately be for the product. Smart cities are broadly defined as an urban development vision to use digital technologies to provide better services and improve the security and sustainability of city assets. It’s a concept that’s steadily gaining momentum across the globe, but smart city initiatives could face funding constraints, according to a recent white paper by Siemens Financial Services. Totem’s product in particular could carry a high price tag if new underground wiring infrastructure needs to be built out for each tower installation. To date, the startup has raised a seed round (amount undisclosed) and is now in the process of raising another round to fund future growth. The first Totem model is slated for release in summer 2017. White paper: "SmartStart Modeling Private-Sector Finance Adoption for SmartStart Cities"